Gold, Chicken Bones, and a "Bouncy Pillow"
Have you ever jumped on the “Bouncy Pillow”? 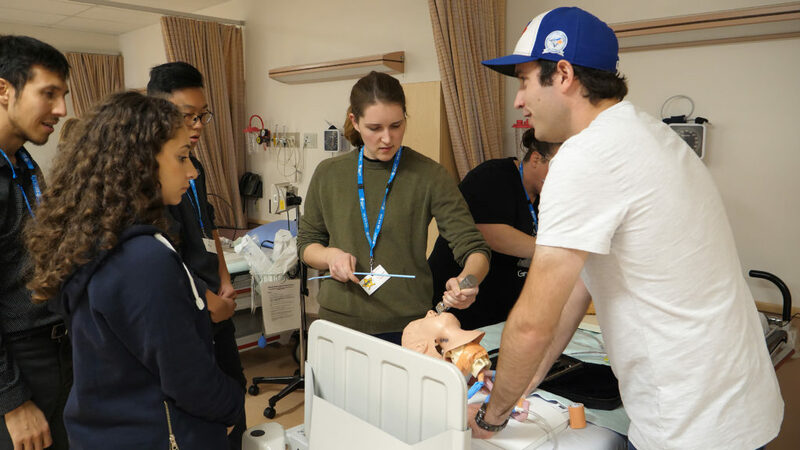 It’s located just outside Peace River, and over 50 post-secondary health-care students had the opportunity to do just that during an RhPAP skills weekend event. A big part of what the weekend is all about is getting a feel for the local area. So, students were kept busy bouncing from one fun activity to the next. 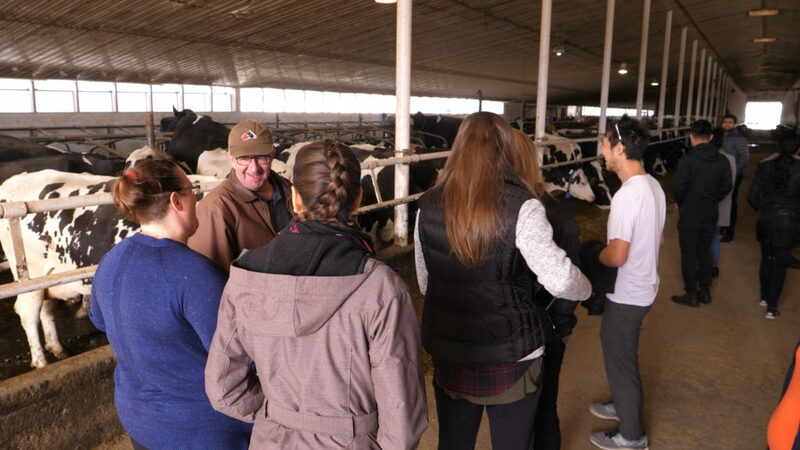 Students had the opportunity to visit the Lavoie Dairy Farm, where about 350 Holstein cows get milked twice a day. The skills weekend is also a chance to discover what health care career opportunities are available in a rural setting like Peace River. Students toured the Peace River Community Health Centre. This hospital serves a large catchment area in Northern Alberta, with patients comoing from as far as two hours away. There’s an operating room, cardiac stress testing, and each year about 400 babies are delivered here. I got to do things that I probably wouldn’t ever get to do as a physio, so I thought it was really cool to experience those sorts of things. – Paiten Brand, 2nd year Physio student, University of Alberta. The other big part of a skills weekend is the chance to learn hands-on medical skills. In Peace River, skill stations included casting, IV starts, Stars mobile education unit, obstetrics, suturing and EMS. Dr. Kylan McAskile teaches students intubation. Peace River physician, Dr. Kylan McAskile taught intubation. He’s no stranger to a skills weekend. He attended three of them when he was a medical student at the University of Calgary. 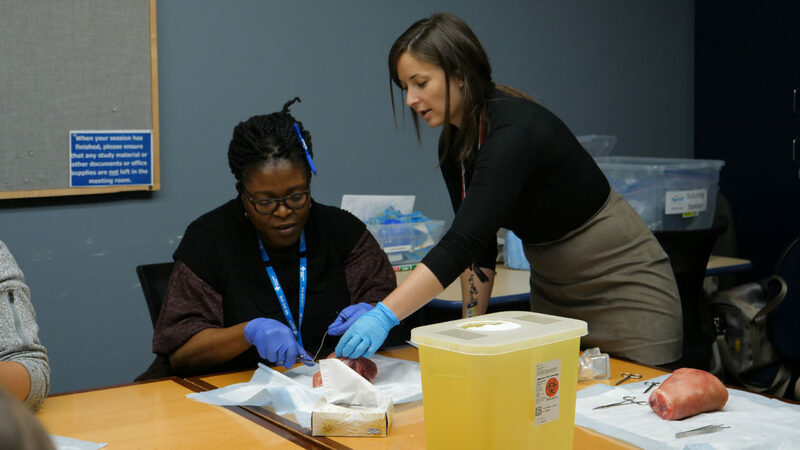 Dr. Annie Hutchison gives a student tips on suturing at the RhPAP Peace River Skills Weekend Event. Over at suturing, Dr. Annie Hutchison, a resident physician in Peace River, was also giving back. A few years back, she attended a skills event in High Level as a med. student. 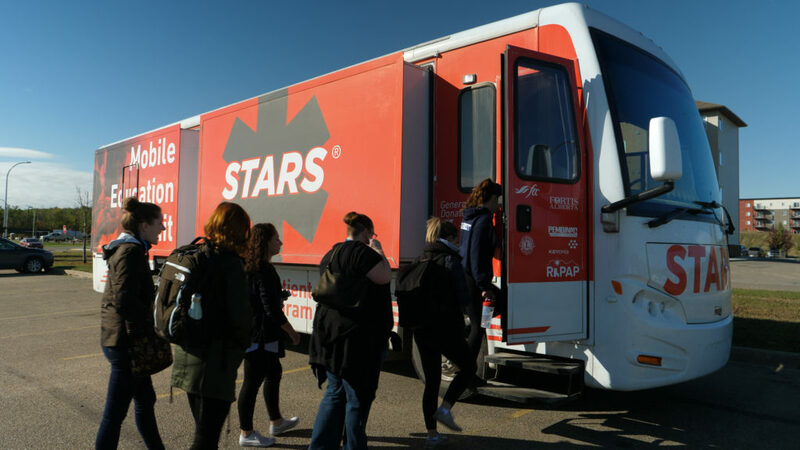 Students enter the STARS Education Mobile Unit, one of seven skill stations set up at the Peace River Community Health Centre. The STARS mobile education unit is always a student favourite. Instructors asked the students to work as a team to treat a “patient”, played by a patient simulator, with serious heart problems. EMS hosted an unusual but fascinating station. What do you do if a patient in serious condition can’t be given medication in the usual way – intravenously? 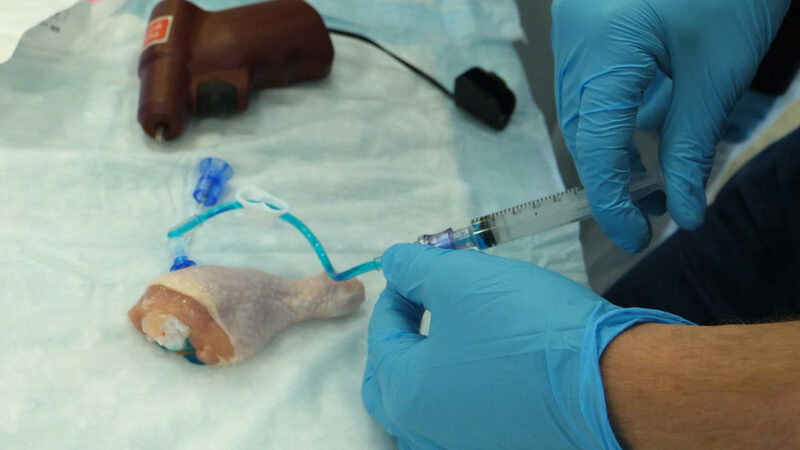 You inject it into the bone – in this case a chicken bone. It’s called an intraosseous injection. 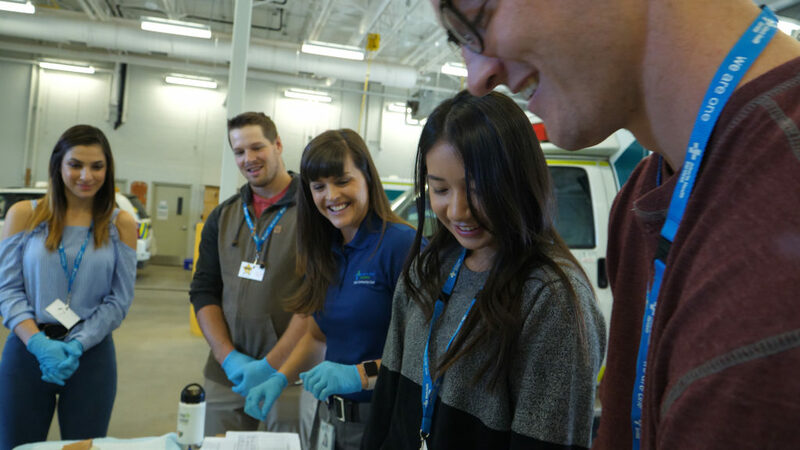 “This is a tool that we can use to immediately get fluids into patients that are severely unwell,” says Tyne Lunn, an advanced care paramedic in the Peace region. Tyne Lynn (centre) looks on while a student injects fluid into a chicken bone. Tyne instructed the EMS Skill Station. While in Peace River, the students made a visit to the Air Ambulance hangar. Two planes are permanently stationed here to transport local patients to hospitals in larger centres, often Edmonton. They also visited the local museum where they discovered the role the mighty Peace River played in the fur trade. Today, this waterway is a gold mine for recreational enthusiasts, and home to the picturesque Shaftesbury Ferry, a must-see for tourists in summer. 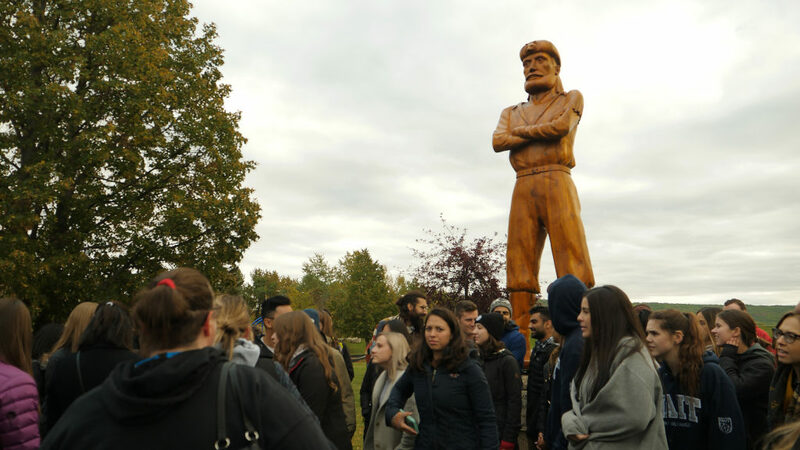 A scenic walk along the riverside gave students the chance to get to know others from different health care disciplines, where they ventured over to a statue of 12-foot Davis. Statue of the legendary 12-foot Davis located near downtown Peace River. While this statue may be 12 feet tall, the real legend, Henry Fuller Davis, was nowhere near that height. The name comes from a small 12-foot mining claim that Davis had near here in the mid-1800s where he found, in today’s dollars, $500,000 worth of gold. It’s really fun to meet the community and see how much the communities come together to show us how amazing it is here. – Julie Munich, 2nd year Medicine, University of Alberta. 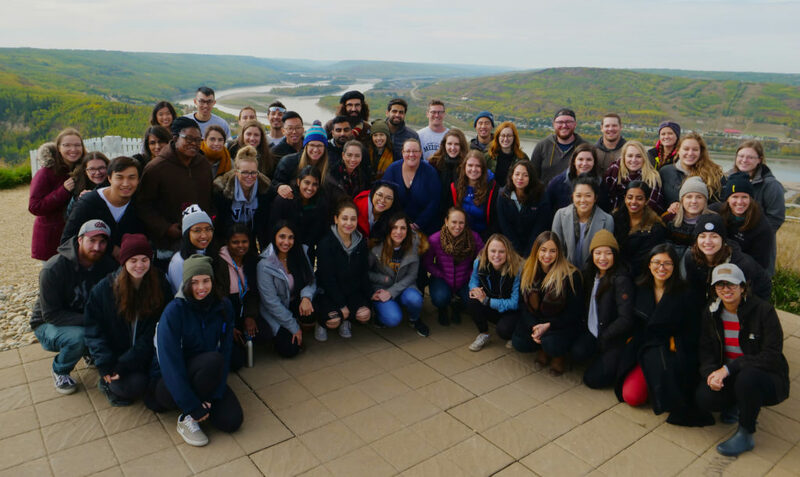 The community hosted a dinner for the students where they heard local professionals share reasons why they love working and living in Peace River. 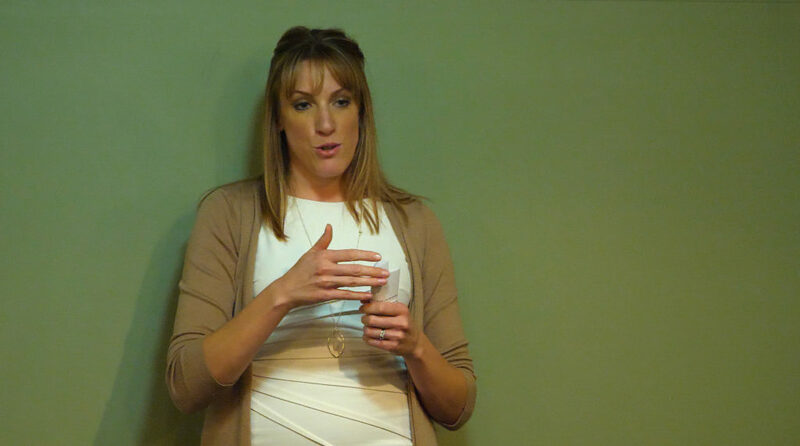 Stacy Jardine, a local pharmacist, spoke to the students about why she loves living and working in Peace River. “They (patients) really do care about you when you come here to practise and it helps you care about them,” local pharmacist Stacy Jardine told the students. The evening wrapped up with a game show, hosted by local comedian Shawn Pitman. Laughter filled the room, and everyone went home with a prize. 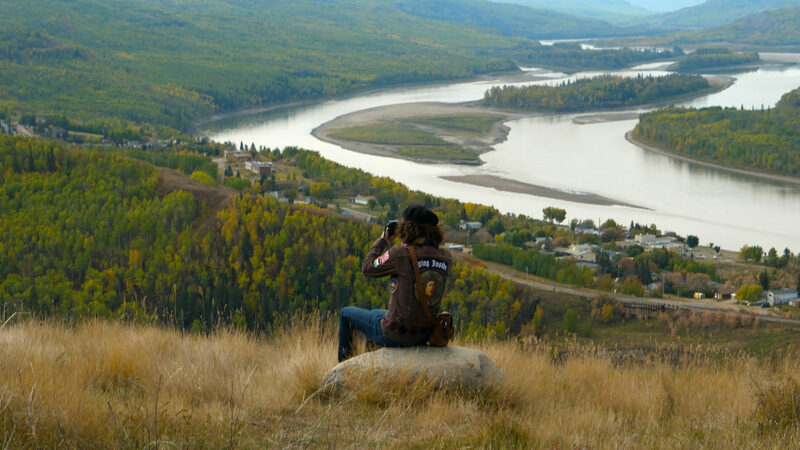 A student takes a photo of Peace River from a lookout above the town. 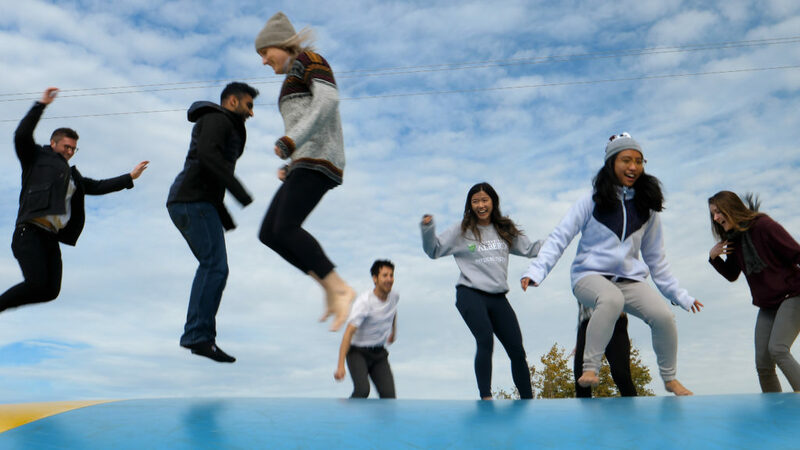 “I actually realize how much I enjoy living in smaller places and the different opportunities you get,” adds Ali Barras, a 2nd year medical student at the University of Alberta. The busy RhPAP skills weekend finished at a viewpoint overlooking the Peace River. It was one last chance to celebrate new friendships, pose for a group photo, and leave with a better vision of what rural health care is really like.